As I head to France for the first time since the attacks, they are being displaced in the news. Here’s some relevant vocabulary. Screenshot of BFM TV’s iPhone news app today. Source: my phone. en cause: in question, involved. le virage: bend, turn, curve; (figurative) shift. minière (adj. ): mining. So, the last story is about the shift towards “greenness” of a former mining town. One of the really frustrating things about French for me is being able to do obscure things like read about the semantics of agentive verbs in French, but not being able to use ! @#%$ pronouns correctly. Ils veulent frapper le quartier général? Do they want to strike the headquarters? Oui, je le pense. Yes, I think so. Tu veux que Daech soit puni? Do you want Islamic State to be punished? Oui, je le souhaite bien. Yes, I really want it. Infinitives can be replaced with a pro-form. Relative clauses can be replaced with a pro-form. The pro-form should be le/l’. Who knew? I sure didn’t. See the Lawless French web site for more. Google Image results for the search “puce.” Picture source: screenshot. So, when my baby brother and I got into a Thanksgiving contest to see who knew the most English color terms, it was clear that things were not going to get very far, in the absence of my sister-in-law agreeing to adjudicate disagreements, and she quickly grew weary of us and disappeared to formulate a new adhesive or something. It turns out, though, that Google Images is a great way to find out what a color term means. Is chartreuse more of a yellow, or more of a green? Go to Google Images. (It’s more of a green.) My brother doesn’t believe me that vermilion is a kind of red? Go to Google Images. So, when we started arguing about puce, the way to a resolution was clear. You can see the results above. What are all those fleas doing mixed in with the purple, though? It took me a second to puzzle through, but you may remember this from an earlier post on high tense rounded vowels. Puce is French for “flea.” “Wait,” said my brother—“haven’t you been calling my daughter ma puce?” Indeed, I have been—as you might remember from the same post, this is something that you could call a granddaughter, a niece, a young cousin. See, this is one of the many reasons that I love my brother: if he runs into some string of phonemes that he doesn’t understand, he doesn’t ignore them—he tucks them away for safekeeping somewhere and looks for ways to figure out what they mean when the opportunity arises. Runs in the family, I guess–I hope that ma puce will be the same when she grows up. le chartreux: Carthusian monk; a breed of large cat with yellow eyes. The “no competing interests” statement from a paper that I submitted the other day. Picture source: me. Since this blog is mostly about my adventures and misadventures in trying to learn French, I often write about sources that I’ve found useful in my studies. I often wonder if people think that I’m getting paid to shill for them. In fact, the opposite is true—I pay for the use of any of the resources that I talk about in this blog that aren’t free. If I don’t say very much that’s bad about French-learning resources in general, it’s because I don’t say very much that’s bad about anything, at least not in public—in my life in general, I tend to mostly talk about things and people that I can say nice things about, and to mostly avoid talking about things and people that I can’t say anything nice about. Why the state of emergency in France allows the government to dissolve associations. I am a joiner. Give me a chance to be part of a community, and I’ll jump on it. At various points in my life, I have belonged to (or still belong to) the Colorado Association of Black Professional Engineers and Scientists, the Jewish War Veterans, the Croatian Fraternal Union, Veterans for Kerry, the United States Judo Federation, Veterans for Obama, United States Judo Inc., Veterans for Hillary, the Colorado Judo League—you get the picture. You may have noticed the odd fact that the state of emergency in France gives the police broad latitude to “dissolve associations.” What’s that all about? In France, you have (at least in theory) one identity: you are French. When there is a census in France, it is forbidden to ask what your ethnicity is, or what your religion is. (If you’re reading this, and you’re French: our government absolutely asks those questions, and more, in America. You’re not required to answer, but the government does ask.) Jean-Benoît Nadeau and Julie Barlow explain the situation nicely in their book Sixty million Frenchmen can’t be wrong. Since the Revolution, everyone has been part of the Republic—no one is excluded. Since your primary identity is as a citizen of the Republic, why would you need or want any other identity? Belonging to anything else is thus viewed with a non-zero, if small, amount of suspicion. “Associations” have to be approved by the government. According to the French Wikipedia page on the 1901 law regarding associations, …parmi les premières mesures de l’Assemblée nationale figurent la dissolution de toutes les communautés religieuses, d’habitants, de métiers, collèges, hôpitaux, confréries, congrégations, qui étaient innombrables, ainsi que l’interdiction par la loi Le Chapelier de reformer des associations d’ouvriers ou d’habitants pour défendre leurs intérêts. “Among the first measures of the National Assembly figured the dissolution of all “communities” [“community” was the term for a non-profit association of any sort under the legal system of the Ancien Régime] that were religious, of inhabitants of any areas, of professions, schools, hospitals, guilds, parishes—which were countless—as well as the interdiction by the Le Chapelier law against reconvening associations of workers or of inhabitants of an area in order to defend their interests.” The law of 1901 clarified a number of aspects of the regulation of associations, along with renaming them associations in place of the earlier term communauté, and gave the regulations their current form. Today there are about 1.3 million associations in France, with about 11 million members. (I don’t think that this includes union members, although it’s not clear from the Wikipedia article. My favorite is an association for the promotion of the past subjunctive and the passé simple tense—now, unfortunately, defunct.) You can search a list of French associations for ones that interest you here. So, that’s what’s up with the odd fact of the state of emergency giving the police the power to dissolve associations. Here is some vocabulary from the Wikipedia article on the law of 1901. Definitions from WordReference.com. la confrérie: brotherhood, fellowship; friary; association, society; trade guild; fraternity. la société: most commonly, this refers to a business or a firm. Deploying France’s one aircraft carrier to the Middle East is a big commitment. Here’s the historical and military context to help you understand why–plus, some French vocabulary. I was a young sailor during the Falklands War between the United Kingdom and Argentina in 1982. 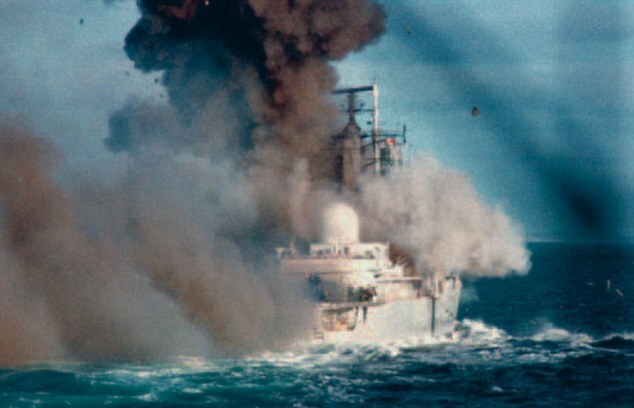 We all watched in silence when footage came on the news of the HMS Coventry taking an Argentinian surface-to-surface missile–it was obvious that despite the US Navy’s excellent firefighting training, not many people would be walking away from a hit like that on one of our ships. The last time two fleets within sight of each other shot cannons at each other was early in World War II. Since then, naval battles have consisted of the opponents launching planes or missiles against each other. Aircraft carriers are the primary source of naval power today, and the purpose of most other ships is to protect or support the aircraft carriers. Screen shot from the BFMTV iPhone app. Picture source: me. 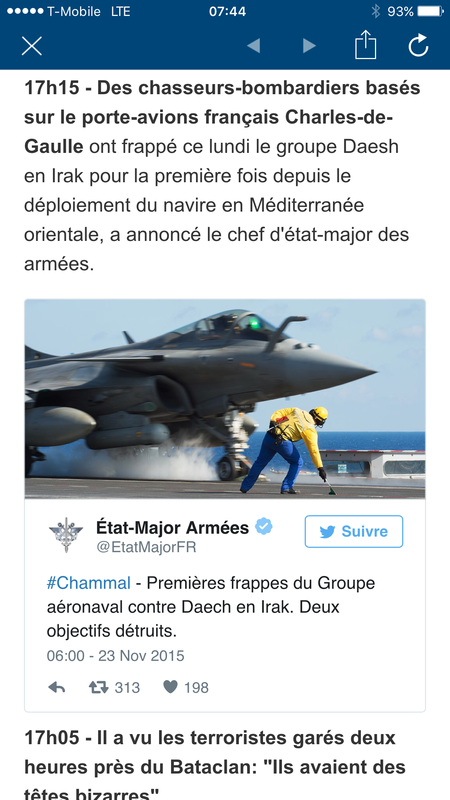 So, it’s a big deal that France just deployed its aircraft carrier, the Charles de Gaulle, back to the Middle East. The cruise was announced on November 5, 2015, but after the 13/11 attacks in Paris, the destination was changed from the Persian Gulf to the eastern Mediterranean, in order to be better able to hit Daesh (Islamic State) targets in Syria. Deploying your aircraft carrier (France only has one) is endangering your aircraft carrier. It’s also committing to a theater of operations–being off the coast of Syria means not being off the coast of West Africa, where France also has strong commitments and heavy involvement. Things to think about while you watch the news today… Here’s some vocabulary from the story about the current Charles de Gaulle deployment that showed up on my cell phone today. Definitions from WordReference.com. la rafale: gust (of wind); burst (of gunfire); barrage, torrent, succession. The Rafale is France’s main fighter jet these days. le porte-avions: aircraft carrier. See above. le navire: ship, boat, vessel. How research on how songbirds learn to sing could prevent tragic cases of languageless humans, plus some French vocabulary. Scientific talks can get as boring as hell if they’re not in your field. However, I recently heard a talk that was outstandingly interesting—not just because it was a really good talk, but because the speaker sang like a songbird. Among other things, I work on the use of language processing to find treatments for spinal cord injuries, so every once in a while, I go to a conference on computational neuroscience. Computational neuroscience is a very broad field, and I might hear talks on subjects as diverse as optic nerve injuries in rats, the mechanics of how to measure brain activity in a mouse, and some of the truly horrifying things that you can do to a rodent in the name of science. A couple months ago, at a computational neuroscience conference, I heard a very nice talk by Jesse Goldberg of Cornell University on the topic of dopaminergic error signals in songbirds. Why is it important to study dopaminergic error signals in songbirds? Songbirds present an excellent opportunity for studying how humans learn language. Not all birds sing. Ornithologists distinguish between bird calls and bird songs. All birds have calls, but only songbirds sing. Song acquisition in songbirds has some similarities to language acquisition in humans. We tend to think of animal behaviors as instinctive, and many of them are, but even instinctive activities may require some amount of social context and experience to learn correctly. Language is very much like this. Humans have an instinct to acquire language, but the specifics of the language that they learn have nothing to do with genetics—it’s completely a matter of which language(s) they’re exposed to in childhood. If I had been adopted by a Malayali family, I would be speaking Malayalam today, not English. Similarly, songbirds have to be exposed to adults singing the song of their species, or they will not learn it. If the songbird is going to transition from babbling to the song of its species, it will have to be able to tell whether or not it is singing well. How can a bird tell if its song is any good or not? It looks like it happens through dopaminergic signaling. Dopamine is an organic chemical that is best known for being associated with rewards and pleasure in humans. There are things that you can do to a baby songbird that you cannot do to a baby human. You can raise them in isolation from other members of their species. (Once upon a time you could deafen them, but I hope that no institutional review board would allow that today.) If a songbird is going to learn to sing, it can’t be exposed to the song of its species at just any old time—it must be exposed in its childhood. Raise a songbird to adulthood in isolation and then put it in a community of its species as an adult, and it’s too late—the bird will not learn its song. There is what we call a “critical period” for this kind of instinctive learning behavior—the learning has to take place by a certain point, or it can’t happen. The same is, unfortunately, true of language acquisition in humans. It is why I will never speak French natively, no matter how hard I study. It is why when deaf children are raised in isolation from other deaf people, they end up in the horrific situation of not having any native language, spoken or signed. (They will typically invent a signed language within their family, but can’t use it to communicate with anyone else, and can’t later learn another signed language natively.) It is the reason for the horrific story of Genie, which I won’t depress you with if you haven’t already heard it. The bottom line is that there are situations that can lead to human beings who have no language, and this is a horrible, tragic thing. If we can learn things from songbirds that might help us to help these people—and there are far too many of them in countries where there are not adequate services for deaf people—then I, personally, am happy to have some of my tax dollars (as we say in the US) go to research on how songbirds learn to sing. La dopamine (DA) est un neurotransmetteur appartenant aux catécholamines, issu de l’acide aminé tyrosine. Dans le système nerveux central, elle active les récepteurs dopaminergiques postsynaptiques. Elle est principalement produite dans la substance noire et dans l’aire tegmentale ventrale2, situées dans le mésencéphale (partie supérieure du tronc cérébral). Bien que la dopamine, avec la noradrénaline et la sérotonine, soient très minoritaires dans le cerveau, puisqu’ensemble, elles concernent moins de 1 % des neurones, elles jouent un rôle modulateur final essentiel des sorties motrices et psychiques. être issu de: to stem from, to derive from; to be produced by. bien que + subjonctif: Although. We’ve seen this construction before, but it bears repeating, as I forget about the subjunctive every time, I’m sure. la sortie: I think that in this context, it’s an efferent nerve, but I’ll have to check—it’s not in WordReference.com. It looks that way from another token of it that I found on the French Wikipedia page on the insect nervous system.